Dialogue4Health. You’ll find web forums about public health and community approaches. There’s also a resource library, where you can find books, articles, presentations, among other public health resources. Research Toolkit. Whether you are just getting started, or have been active in research for a while, they have tools and guidance for all aspects of a research project, so that you don’t have to start from scratch. This web site is organized by the research’s phases, and all of their resources have been vetted and curated by their team. 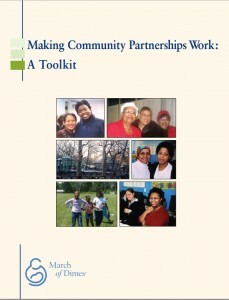 March of Dimes-Making a Community Partnership Work: A toolkit (pdf document). This toolkit is written for newcomers and seasoned organizers, community-based groups, public and private foundations, as well as local, state and federal government agencies. Although it is written for those interested in public health and human services, this toolkit can still be useful to individuals and groups addressing other community issues. Michigan Public Health Training Center-Community-Based Participatory Research: A Partnership Approach for Public Health (Free Course). This downloadable file is intended as an introduction to Community Based Participatory Research for people who are in the early stages of using or considering using it. It is designed for academic researchers from multiple fields, including but not limited to: public health, education, nursing, medicine, and members of community-based organizations. National Institute of Health Office of Behavioral and Social Research. Community Based Participatory Research(CBPR) Funding Opportunities and Training Initiatives. Here you can find more information about CBPR, recent funding opportunities for studies using CBPR, recent training initiatives, and other useful information. Developing and sustaining Community Based Participatory Research (CBPR) partnerships: a skill building curriculum. This evidence-based curriculum is intended as a tool for community-institutional partnerships that are using or planning to use a CBPR approach to improving health. It can be used by partnerships that are just forming as well as mature partnerships. Community toolbox (University of Kansas). Tools to help make a quick start on key activities in community work. You can learn community-building skills step-by-step; use a simple model for general guidance on assessing, planning, taking action, evaluating, and sustaining your work; access stories from people doing studies in different communities; and different services. 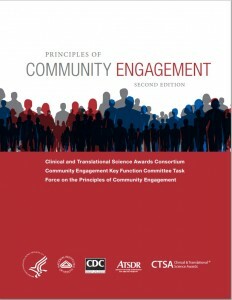 Principles of Community Engagement 2nd edition (online book). 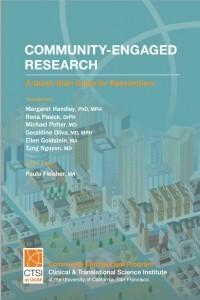 Community-engage Research: a quick start guide for researchers (online guide). Centers for Disease Control and Prevention (CDC) – Division of Heart Disease and Stroke Prevention. Webinar: Promoting Policy and Systems Change to Expand Employment of Community Health Workers (CHWs). This course is designed to provide state programs and other stakeholders with basic knowledge about CHWs, such as official definitions of CHWs, workforce development, and other topic areas. In addition, the course covers how states can become engaged in policy and systems change efforts to establish sustainability for the work of CHWs, including examples of states that have proven success in this arena. National Institutes of Health (NIH), National Heart Lung and Blood Institute (NHLBI)-Your Heart, Your Life: A lay health educator’s manual. 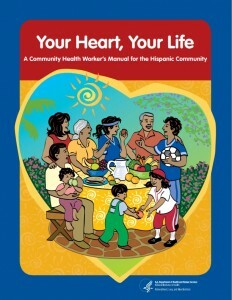 This manual is part of the Salud para su Corazón initiative sponsored by the NHLBI. Salud para su Corazón develops the tools and strategies to promote heart health among Latino individuals, families, and communities. Stanford University, Patient Education Research Center-Spanish Chronic Disease Self-Management Program (Tomando Control de su Salud). In this site you can find information about the Chronic Disease self-management program. But if you’re interested in taking the course to be a certified trainer, Puerto Rico’s Department of Health has the license to certified interested persons as trainers. You don’t have to be a health professional to be certified. Stanford University, Patient Education Research Center-Spanish Diabetes Self-Management Program (Programa de Manejo Personal de la Diabetes). 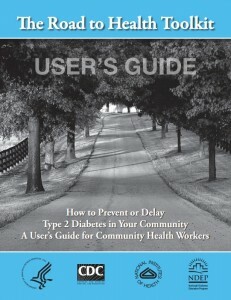 In this site you can find information about the Diabetes self-management program. But if you’re interested in taking the course to be a certified trainer, Puerto Rico’s Department of Health has the license to certified interested persons as trainers. You don’t have to be a health professional to be certified. 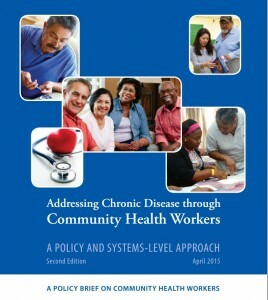 CDC-Addressing chronic disease through Community Health Workers: A policy and system-level approach. 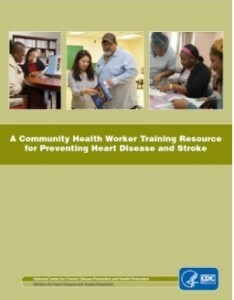 This document provides guidance and resources for implementing recommendations to integrate community health workers (CHWs) into community-based efforts to prevent chronic disease. Note: These links are being provided as a convenience and for informational purposes only; they do not constitute an endorsement or an approval by the Endowed Health Services Research Center of any of the products, services or opinions of the corporation, organization or individual. The Endowed Health Services Research Center bears no responsibility for the accuracy, legality or content of the external site, or for that of subsequent links. Contact the external site for answers to questions regarding its content.